“The Red Rose” a newly released signed limited edition print of 125 is now available from Blankenship Fine Art Studios of Wilmington, DE. Each print is a genuine Qorographic print using state of the art pigments on 100% acid free Matisse paper. Qorographs are water resistant and lightfast museum quality prints. The print measures 11″ X 14″ and is signed and numbered by the artist Roy Blankenship. 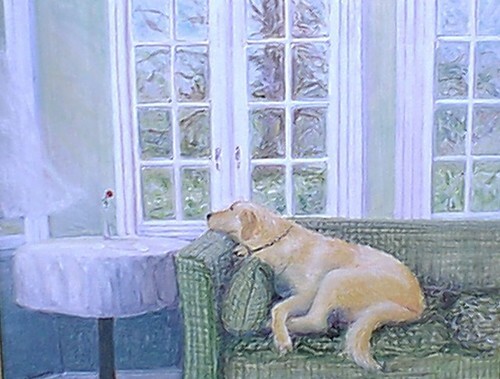 The original painting “The Red Rose” was inspired by a remarkable story of magical devotion between a wonderful homebound male yellow lab who would pine over the absence of his traveling master. The lab knew that the symbol of the single red rose when placed on the sun room table meant his master was coming home and would wait on the sofa staring at the rose and the window until his master returned home. “The Red Rose” retails for $95.00 and is available from Blankenship Fine Art Studios (302)-529-1184.